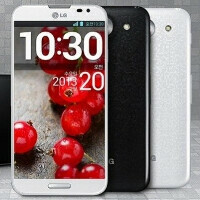 The AT&T branded version of the LG Optimus G Pro is getting an update, but it is not to Android 4.2.2. Actually, owners of the device might find this a better update than the next Android OS build. This new update brings the feature-rich Value Pack update to the handset. For example, Dual Camera will be a new feature on the unit. This allows both the front and back camera of the phone to be used at the same time. Another new feature, Smart Video, sounds like it was taken right off of the Samsung Galaxy S4. This feature pauses a video when the front-facing camera determines that you have your eyes diverted from the screen. Once you have placed your full attention on the phone's display, the video resumes playing. A couple of cool AT&T features that are part of the update include Unused Apps, which tells you if an app you have installed hasn't been used in a while and reminds you that it can be uninstalled. To access that feature following the update, you need to go to Settings> Apps> Menu> Unused Apps. You will also find shortcuts to the AT&T Data folder so that you can try to modify apps that have been using more data and consuming more battery life than they should. The Value Pack is being sent out OTA which means it could be a few days before the notification pops up on your LG Optimus G Pro. But don't fret. There is a way to try to pull it out manually. Go to Menu > Settings > General > About phone > Software update > Update Now. AT&T suggests you be connected to a Wi-Fi signal while downloading the update. People still buy LG phones? The G Pro is a wannabe note 2 and with those updates it wants to be like the Gs4. Check quadrant score before ,than after. The CPU has been tuned way down. The CPU integer that is. I went from almost 12,000 to under 9,000. Seems to charge faster, still no hiccups in actual performance. Oh. Those features sound familiar...along with that design that was already very familiar to start with... In all seriousness though, I'm not one to call copycat on companies like all these fanboys constantly do. Smart people understand that most inventions are simply a better version of another or an expansion of an already existing device. That being said, LG seems determined to follow in Samsung's footsteps every bit of the way recently. Considering Samsung's success in this space as of late, I suppose it's not the worst thing they could do. Perhaps, they could try following Samsung's lead when it comes to major updates, too. This phone kills͵ galxy note 2͵ and is nothing like it. did it have a IR blaster? No!!!! First of all, the G Pro is better than the Note II will ever be, secondly, LG confirmed these features for the G Pro at MWC 2013 which was a few weeks before the Galaxy S4 was even released. So look who's copying who.